According to “The 2016 WeChat Data Report”, WeChat as one of the most popular apps in China, has reached 768 million daily users in September, 2016. Therefore, for most of brands, who wants to enter or get more exposure in China, and get Chinese customers in their list, this is something you shouldn’t ignore. 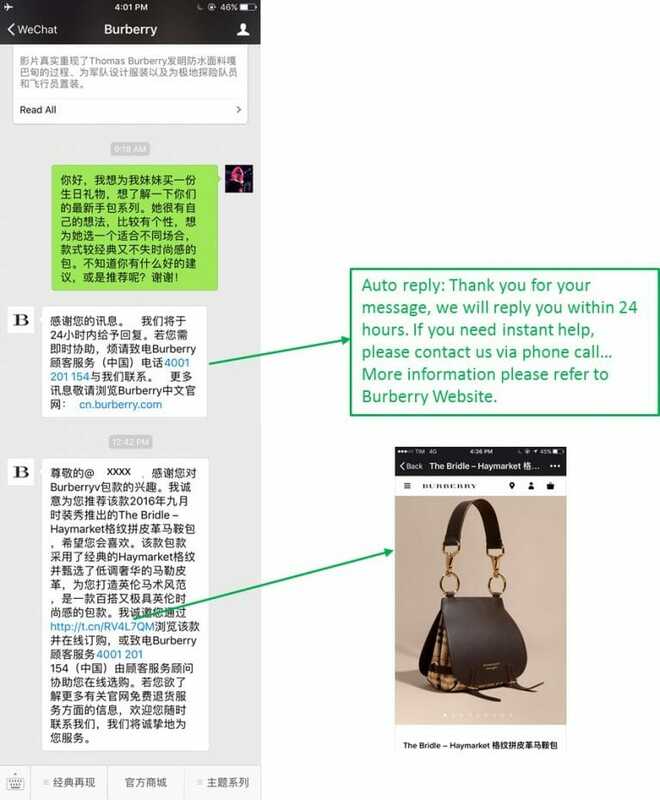 In our latest report “China Online Boom: … yet to come for Ostrich Luxury Brands”, we did a deep dive research about how 33 luxury and fashion brands perform on WeChat (Celine doesn’t have WeChat yet), with respect of Local Content on WeChat Post, Online Store on WeChat, and Style Advisor: WeChat Assistance. 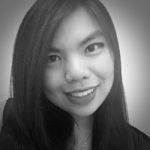 Here are some more examples we would like to share. 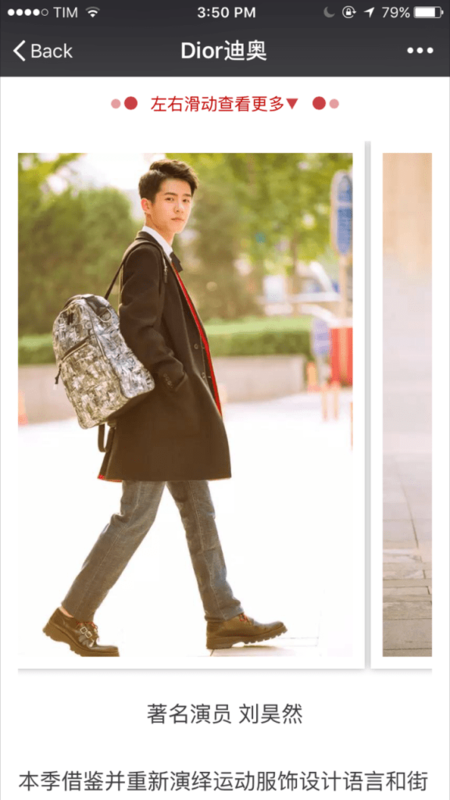 Apart from sending general posts about the latest collections and fashion show information, highlighting local content is crucial to reach Chinese readers. 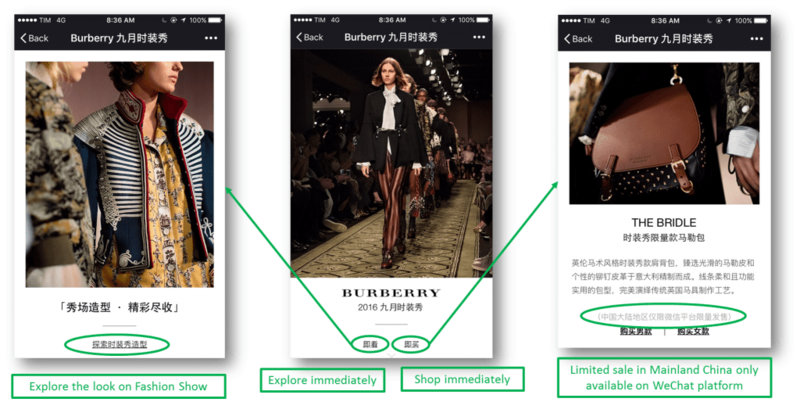 We evaluated the % of local contents on WeChat posts from October to December, 2016; lots of brands has really nice localized content, but the frequency is not too high, only 4 brands reached more than 50% (Cartier, Hugo Boss, Michael Kors, and Ray-Ban). 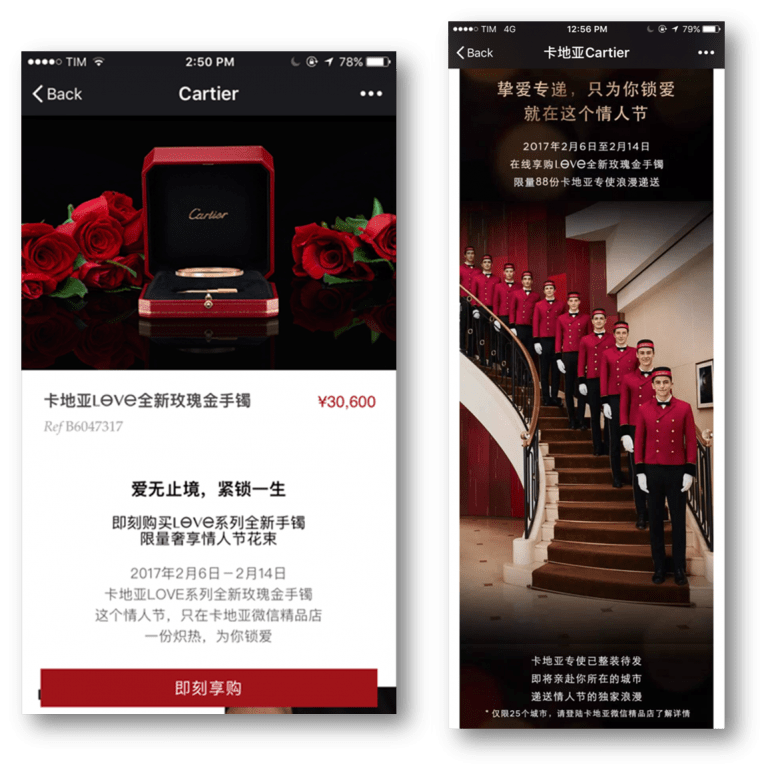 Cartier the only brand in the panel with a permanent store on WeChat (during the period of our analysis). 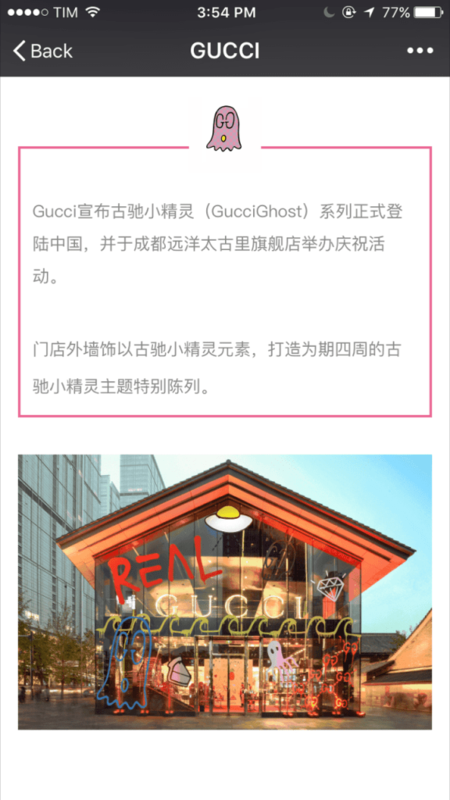 Besides, there were 4 brands trying temporary WeChat boutiques from July 2016 to January 2017, and most of them decided to offer limited edition products only sold on WeChat during a specific time. 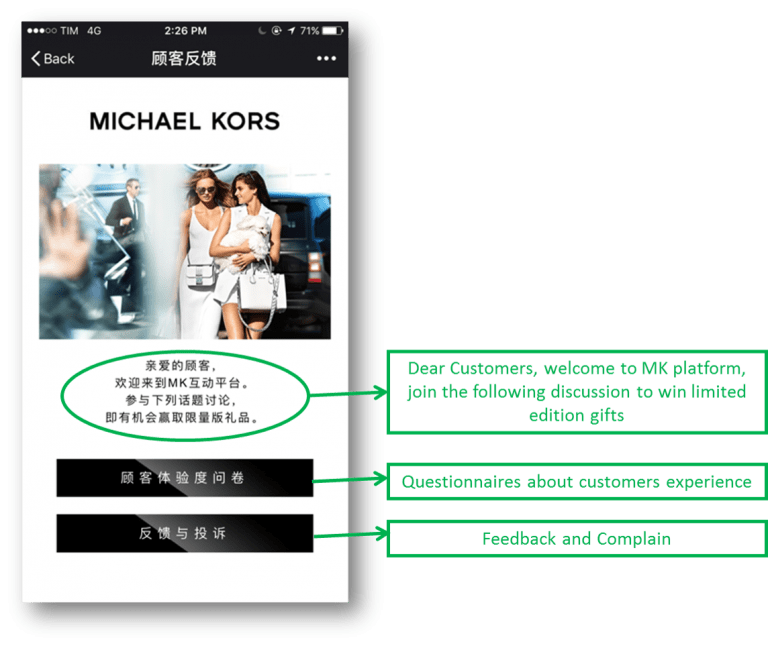 In fact, launching a limited offer for some special occasions on WeChat could be quite a good idea, not only to test the markets, but also because brands are able to provide more personalized and exclusive contents and offers for Chinese customers. One of the best examples to show exclusiveness is the latest valentine campaign done by Cartier. From 06/02 to 14/02, 150 pieces of specially designed Cartier pink gold bracelet from LOVE collection were sold exclusively on Cartier WeChat boutique. Furthermore, Cartier sent its bellboys to deliver the first 88 orders, and the rest 62 bracelets were sent with flowers. 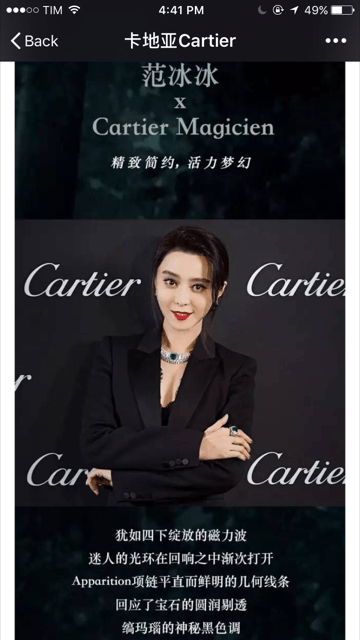 This lovely campaign draw lots of attentions, and the bracelets were sold out within one week since their debut on WeChat boutique, according to Cartier. 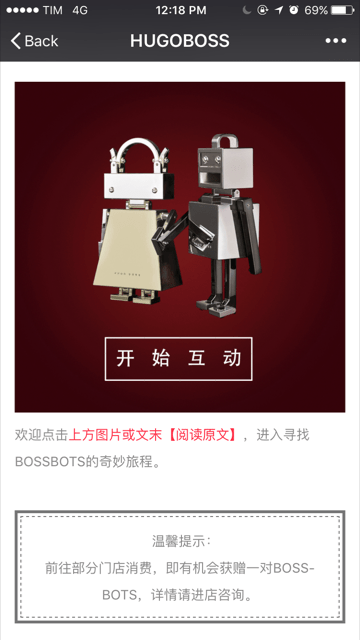 WeChat can also be a key channel to offer Customer Assistance. We tested all brands in the panel about the style advisory service. Only few brands had immediate reply with style advise, lots of brands have only auto-reply refering to customer service. Although Burberry didn’t reply immediately, they sent a nice auto-reply, followed by a helpful style advisory answer within a day. 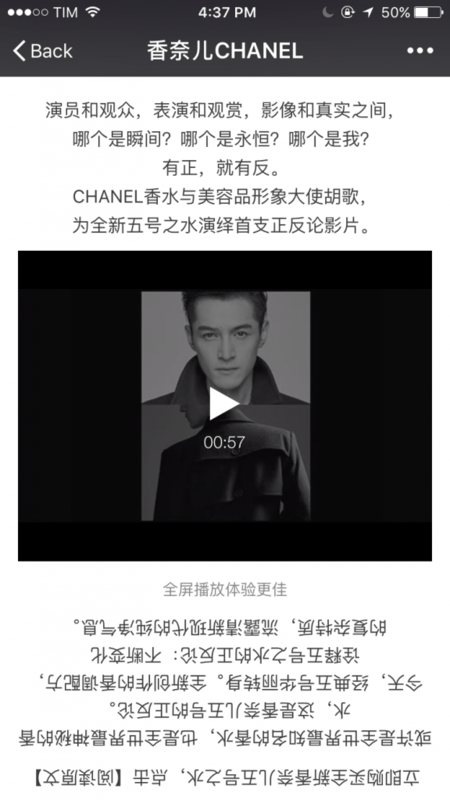 More information about Style Advisory case study via different channels, please refer to “Style Advisory’s Case Studies: Telling Stories via Different Channels in China”. 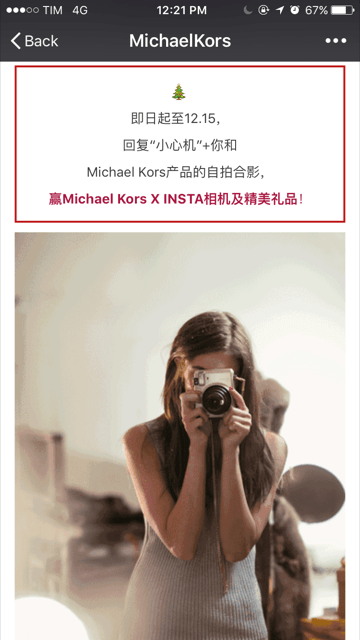 There are more interesting and helpful functions on WeChat that brands can exploit, in order to be as local as possible and providing thoughtful services for Chinese customers, as in the case of Michael Kors.